We sold this Daimler last year to a regular customer (by that I mean that he changes his classic cars two or three times a year!) He has now moved to a house with a smaller garage so the big car has to go. A Daimler V8 for regular use. 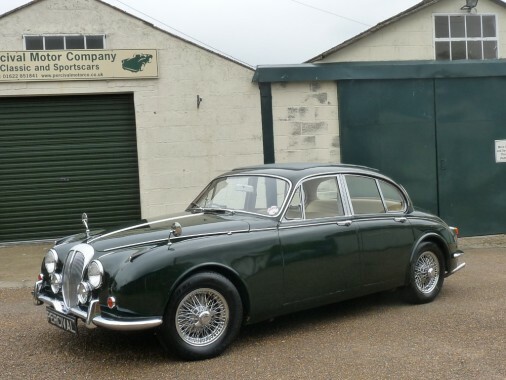 This car has a totally rebuilt and uprated Russ Carpenter Daimler 2 1/2 litre V8 engine and is fitted with a Jaguar XJ40 four speed automatic gearbox. It also has an LPG system fitted giving well over 30 mpg over the last few years, and an alternator in place of the dynamo. The car has original power steering and drives superbly with little loss of power through the gearbox that you experience with the original, sluggish DG ‘box. The engine is quiet and powerful and can run all the time on LPG as an upper cylinder lubrication system is fitted. The interior has been refurbished with beautiful polished woodwork, new carpets and re-connolised leather seats and a new sunroof. It runs on chrome wire wheels. The work was carried out about six years ago.